1.) I could create GIFs of the Penguins losing races to loose pucks…...The time needed wouldn’t be worth it……..It happened repeatedly all night. 2.) I could single out blown defensive assignments that led to odd man rushes…….But honestly there were too many to count. The only thing that does matter is that the Penguins got outworked and outplayed. That’s it. If pictures are worth a thousand words then someone whose work can tell stories is @DTMAboutHeart . He's a great follow and I would highly recommend it. Contrary to the belief that Columbus came out of the gate flying, this shows that it wasn't until AFTER they scored the first goal, around the 15:00 mark that they started to dictate play. In my opinion the second and forth goals both pushed and reinforced focus on the part of Columbus. I use the word "focus" because a friend of mine who was on my wrestling team in high school once stated that there is ultimately no such thing as "momentum" just varying degrees of focus and execution. Momentum simply gives us an excuse to act like there is some power out of our control. 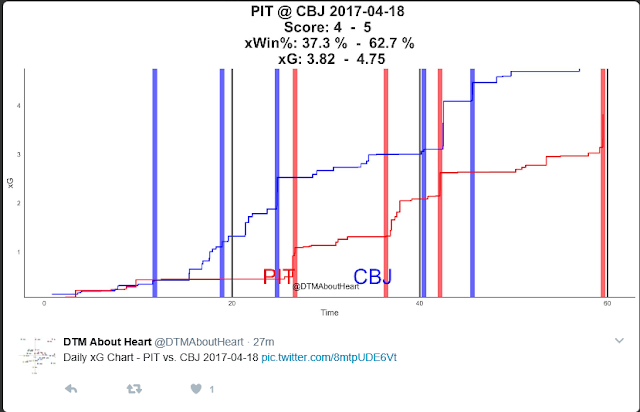 And, last night's game was completely in the Penguins control! So, with that I'm going to take a deep breath and sum this up with a few final thoughts. 1.) Columbus may have been a .500 team during the stretch run but they won 50 games for a reason. 2.) Their coach may not be an emotionally stable legendary leader, but he knows how to motivate and he taps into the effort side of success that is very essential in general. This is the battle the Penguins need to win in game 5 to give them the best chance to win the overall battle in goals on the scoreboard. 3.) It's not some mysterious trait. Hustle and attention to detail can be taught to ANYONE…….talent cannot. The Penguins have more talent! They need to increase their focus and execution so their talent overcomes the BJ’s. Have a great rest of the day and Let's go Pens!